We are having an online Estate sale. We found a real treasure! The platter measures 23 1/2 inches long. Each plate has a 9 1/4 inch diameter. Every piece in the set has scalloped edges. Since the set is handpainted there are slight variations on each plate. There are also two different fish depicted. One fish is slimmer and his mouth is at a higher angle than the other. Unfortunately, four of the twelve plates are chipped. I have included close up photos. A gravy boat and resting plate are also included in the set. Each piece is stamped AK Limoges France. This set is guaranteed authentic AK Limoges France. Comes from a smoke free home. 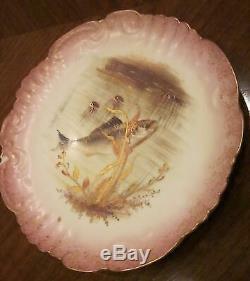 The item "15 PC AK LIMOGES Handpainted Fish Platter, Plates, Gravy" is in sale since Thursday, December 15, 2011. This item is in the category "Pottery & Glass\Pottery & China\China & Dinnerware\Limoges". The seller is "runwayrelaunch" and is located in Atlanta, Georgia. This item can be shipped to United States, Canada, United Kingdom, Denmark, Romania, Czech republic, Finland, Hungary, Latvia, Lithuania, Malta, Estonia, Australia, Greece, Portugal, Cyprus, Japan, Sweden, South Korea, South africa, Belgium, France, Hong Kong, Ireland, Netherlands, Poland, Spain, Italy, Germany, Austria, Israel, Mexico, New Zealand, Singapore, Switzerland, Norway, Croatia, Brazil, Colombia, Jamaica, Panama, Taiwan, Barbados, Bermuda, Bolivia, Ecuador, Egypt, French guiana, Guernsey, Gibraltar, Guadeloupe, Iceland, Jersey, Cayman islands, Liechtenstein, Luxembourg, Monaco, Martinique, Nicaragua, Peru, Paraguay, Reunion, Bahamas, Uruguay.